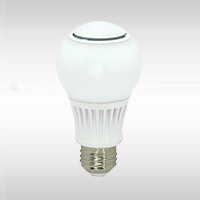 Today's advanced LEDs are long-lasting, dimmable, available in both warm and cool light colors and, of course, extremely energy efficient. LED stands for "light emitting diode" and, though the name sounds quite technical, the benefits of using LED lighting are crystal clear. 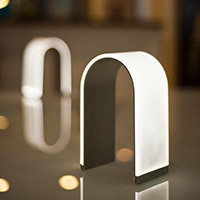 These energy-friendly fixtures present a number of advantages over incandescent light sources that include a longer lifespan, greater durability and, most importantly, they consume 75% less energy. 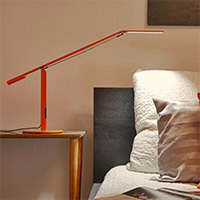 Consider any of these modern LED lights to refresh your home. 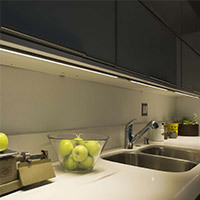 LED technology has made giant strides in the last few years, with huge advances in quality, design and durability. Today's LEDs offer so many benefits...they're dimmable, energy efficient, silent, long lasting and available in many light color temperatures, both warm and cool. While the initial price of LED lighting may be higher, when comparing the lifetime of these bulbs and fixtures to that of incandescent or even fluorescent bulbs, the benefits far outweigh the cost. Believe it or not, many of the LEDs made back in the 1970s and '80s are still in operation today! LED is a welcomed choice of lighting for nearly any room of the house or in commercial locations like hotels, hospitals, restaurants and educational facilities. Ceiling lights and wall lights powered with LED technology are guaranteed to keep things bright and energy efficient while saving you money over time. Consider adding an LED-powered suspension over the dining room table or LED recessed lighting in areas with high, hard-to-reach ceilings. Due to the lifespan of the integrated LED, you won't have to worry about changing the bulb in the fixture for a very, very long time. Entryway and open foyer areas brighten with welcoming personality thanks to LED pendants and chandeliers. They are friendly to the environment and on the eyes of the guests entering your home. Layer the amount of lighting in any given space with LED sconces and wall-mounted fixtures, and consider an LED desk or task lamp for the home office. If you're up buring the midnight oil, the brightness of the lamp will keep you on track. 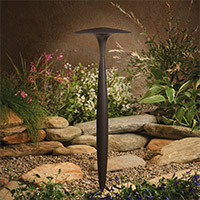 And if you need to brighten up the outdoor living areas of your home, look to the LED landscape lighting available. From bright bollards and path lights to fixtures you can use on the deck or patio, you'll be sure to appreciate the assortment. While highly modern in their design and ingenuity, these LED fixtures can appeal to a number of interior decorating themes. 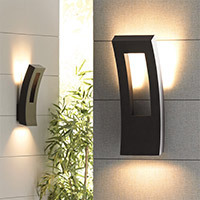 As a leader in bath and outdoor fixtures, Modern Forms is a go-to brand for the best in LED. With sleek shapes, sharp lines and the latest in energy-saving technology, Modern Forms has a selection of products perfect for any application. 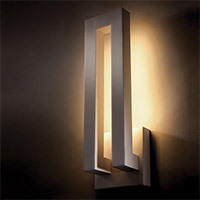 Casual areas of the home benefit from WAC Lighting's LED recessed trims and housings. These low profile fixtures are optimal for rooms with tall ceilings and for those where you don't have much real estate on the ceiling. Keep air flowing in the house with an LED-powered ceiling fan from Fanimation. These ultra-modern designs even feature Bluetooth technology to make controlling the fan a breeze. 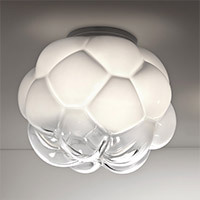 Artemide combines its collection of Italian-made designs with LED technology to deliver a wide variety of fixtures to choose from. 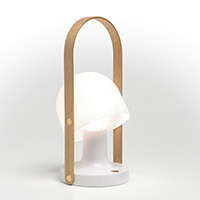 Finally, if you're shoppping for a portable lamp, you'll want to check out the offering from Koncept. As with any light fixture, choosing an LED light fixture depends on your aesthetic preference and the size of the fixture you need for your space, as well as colors, finishes and important features. First, decide where you're in need of lighting in your home. Larger LED ceiling lights work well in dining rooms, open living rooms and kitchens, while an LED desk lamp makes for the perfect companion in compact offices. And not all LEDs are created equal -- you'll find each fixture carries a different level of brightness and color hue based on the color temperature of the LED inside. You will want to select warmer LEDs for general, ambient illumination and bright, cool temperature LEDs for focused light output. Take a look at our guide to understanding lumens to get a better idea of the brightness you can expect from a particular LED-infused light fixture. Next, opt for colors and finishes of fixtures that will best blend in with your existing decor. Or, you can choose colors that will help give a room its personality. If you have any questions about the LED light fixtures and lamps featured here, please call our lighting experts at 877.445.4486. When it comes to dimming an LED fixture, you will want to see the line of contemporary dimmers and light switches from Legrand Adorne. Legrand offers a unique selection of wall plates, outlets and dimming switches to ensure you have a cohesive design throughout your space. 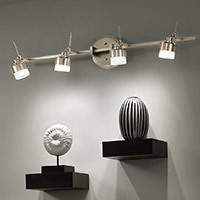 Most LED fixtures have the capability of being dimmed, but you'll want to double check any fixture you're interested in. If you love the sleek chandeliers featured in this collection, you may also want to see all of the modern chandeliers available. From large chandeliers to those embedded with Swarovski crystals, you're sure to find an option you'll love. 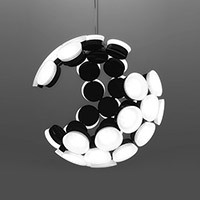 And while you're upgrading the lighting in your home, consider refreshing your furniture too. From new pieces for the dining room and kitchen to those items that complete the bedroom's look and feel, you'll find just what you need.